Our 22' Corkscrew Water Slide is known for thrills with its height and fast paced slip. Its huge height is sure to get attention! 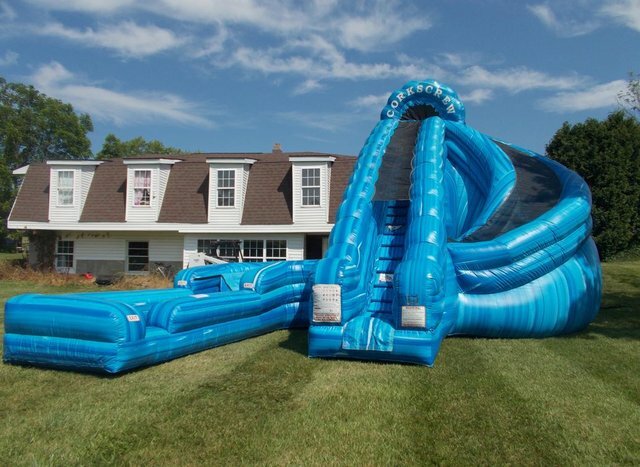 This 22-ft unit can be used either as a water slide for hours of slipping and sliding fun on a hot day or turn off the water and it works perfectly as a dry slide. Our 22' Single Lane Corkscreew Water Slide is ideal for a number of outdoor events, including birthday parties, family reunions, Fourth of July celebrations, carnivals, barbecue, fundraisers and more. This inflatable slide will suit your outdoor entertainment needs.